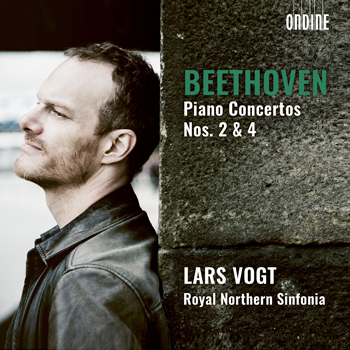 This recording is the final volume in Lars Vogt’s new cycle of Beethoven’s Piano Concertos on Ondine. This recording includes Piano Concertos Nos. 2 and 4, two outstanding examples of Beethoven's writing. Conducting Royal Northern Sinfonia from the keyboard, Vogt’s fresh interpretations of the Beethoven concertos have been widely welcomed, and recently he was nominated for Artist of the Year 2017 award by the Gramophone magazine. Beethoven’s 2nd Piano Concerto was, with the exception of its last movement, largely written before 1789, and therefore it predates the 1st Piano Concerto by several years. The work was premiered in 1795 with Beethoven debuting as piano soloist. The composer used this work as his visiting card but the work remained unpublished until 1801. This early work shows the influence of Mozart but at the same time it is a powerful evidence of Beethoven’s development as a composer towards maturity. This is manifested clearly in the beautiful slow movement of the concerto. Beethoven’s 4th Piano Concerto, considered by many as his best achievement in the field of piano concerto, was first publicly premiered in Vienna in 1808 in a legendaric concert together with the premieres of his 5th and 6th Symphonies and the Choral Fantasy. Beethoven opens this work in a revolutionary way by means of a calm dialogue between piano and orchestra. Throughout the work the piano often has a supportive role and majority of themes are introduced by the orchestra for the pianist to develop. The second movement is also revolutionary in its form and includes some of the most dramatic music that Beethoven ever wrote – only to be contrasted by the boundless joy and freedom of the final movement.